Appointments in my office and phone consultations are available Monday and Wednesday from 10:00 AM to 3:00 PM, Tuesday and Thursday from 12:00 PM to 5:00 PM, and every other Saturday from 10:00 AM to 3:00 PM. To schedule an appointment, scroll down this page to find the link to my online booking program. That will show you everything that is available. If you need a special time that is not available, please email me and I will try to accommodate you. 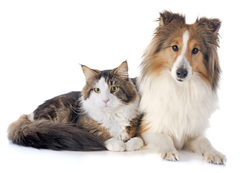 The initial appointment for all new clients lasts two hours, and includes a thorough review of your pet's medical records, a complete physical exam, bodywork/adjustments (if appropriate), education about feeding a species-appropriate diet, individualized nutritional support, and homeopathic prescribing for your pet. A written treatment plan and handouts are provided as well. Brief updates and questions that arise soon after the initial appointment about the treatment plan or your pet's progress are included in the initial cost of the service. Please mail, email, or bring with you your pet's complete medical records (not just the most recent, must include doctor's notes and lab test results) and the ingredient list of the food you are feeding. I do not have a fax machine. Emailing or mailing records to me in advance of the appointment will save time during the appointment so that we can do more important things. If you are feeding a raw or homemade diet, please bring a list of what you feed your pet in an average week. Bring any medications and/or supplements you are using, as well as any treats you give your pet. And bring your dog or cat! Make sure you have had enough caffeine so you can pay attention, and don't bring the kids (they will be really bored). Extra pets are welcome! Follow up appointments are necessary to ensure that your pet is improving as desired. The first follow up is scheduled 4-6 weeks after the initial visit, and every 4-6 weeks thereafter until your pet's issues are resolving to our mutual satisfaction. Follow ups are scheduled at the end of every appointment. Email updates between appointments may also be necessary. Wellness exam (30 minutes): $65 - See information about the Spring Clinic days on the Events page! Supplements and homeopathic remedies usually cost $12-$60, and I provide a separate shopping list for items available online or at local health food stores. Holistic Veterinary Care is not equipped to handle emergencies; therefore you should have an emergency animal hospital in mind before a crisis happens. Payment may be made by cash, check, credit/debit card, or PayPal. Annual physical exams are necessary in order to maintain active patient status. An active Veterinarian-Client-Patient Relationship is necessary for prescriptions and telephone or email advice. Please send your pet's medical records via mail or email. I do not have a fax machine. In addition, a detailed health history written by the owner is often helpful. Please include the ingredient list of the foods you are feeding, any medications or supplements that you are using, and a list of treats. Please email your pet's medical records at least 24 hours prior to the conversation so that I have something intelligent to say when we talk. Telephone consultations are scheduled via the link above. A detailed treatment plan will be provided via email, with either the email or the phone consultation. Reasonable continuation of the initial conversation is included, especially as questions or concerns may arise as a natural treatment plan is initiated. Holistic Veterinary Care is not equipped to handle emergencies; therefore you should insure you have an emergency animal hospital in mind before a crisis happens.